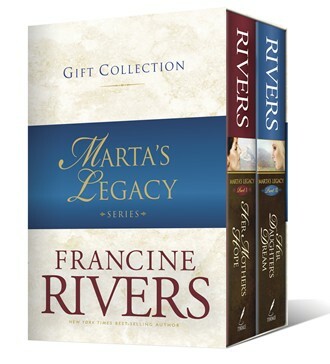 The two volumes of this unforgettable, New York Times bestselling series from beloved author Francine Rivers are now available in a limited edition hardcover boxed set. Her Mother's Hope and Her Daughter's Dream tell the story of four generations of women in one family who are all searching for their God-given place in the world. A rich and moving epic, the series spans decades and continents to explore the sacrifices every mother makes for her daughter and the very nature of unconditional love. Near the turn of the twentieth century, fiery Marta Schneider leaves Switzerland for a better life, determined to fulfill her mother's hope. Her formative journey takes her through Europe and eventually to Canada, where she meets handsome Niclas Waltert. But nothing has prepared her for the sacrifices she must make for marriage and motherhood as she travels to the Canadian wilderness and then to the dusty Central Valley of California to raise her family. Marta's hope is to give her children a better life, but experience has taught her that only the strong survive. Her tough love is often misunderstood, especially by her oldest daughter, Hildemara Rose, who craves her mother's acceptance. Amid the drama of World War II, Hildie falls in love and begins a family of her own. But unexpected and tragic events force mother and daughter to face their own shortcomings and the ever-widening chasm that threatens to separate them forever. A rich and deeply moving story about the silent sorrows that can tear a family apart and the grace and forgiveness that can heal even the deepest wounds. Growing up isn't easy for little Carolyn Arundel. With her mother, Hildemara, quarantined to her room with tuberculosis, Carolyn forms a special bond with her oma Marta, who moves in to care for the household. But as tensions between Hildie and Marta escalate, Carolyn believes she is to blame. When Hildie returns to work and Marta leaves, Carolyn and her brother grow up as latchkey kids in a world gripped by the fear of the Cold War. College offers Carolyn the chance to find herself, but a family tragedy shatters her newfound independence. Rather than return home, she cuts all ties and disappears into the heady counterculture of San Francisco. When she reemerges two years later, more lost than ever, she reluctantly turns to her family to help rebuild a life for her and her own daughter, May Flower Dawn. Just like Carolyn, May Flower Dawn develops a closer bond with her grandmother, Hildie, than with her mother, causing yet another rift between generations. But as Dawn struggles to avoid the mistakes of those who went before her, she vows that somehow she will be a bridge between the women in her family rather than the wall that separates them forever. Spanning from the 1950s to present day, Her Daughter's Dream is the emotional final chapter of an unforgettable family saga about the sacrifices every mother makes for her daughter--and the very nature of unconditional love. 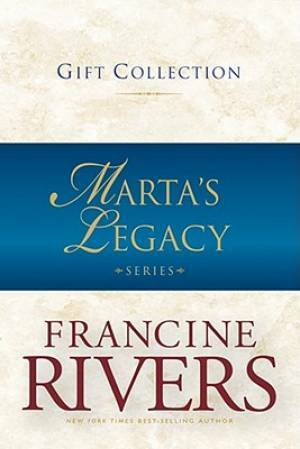 Marta's Legacy Boxed Set by Francine Rivers was published by Tyndale House Publishers in September 2011 and is our 53608th best seller. The ISBN for Marta's Legacy Boxed Set is 9781414360096. Be the first to review Marta's Legacy Boxed Set! Got a question? No problem! Just click here to ask us about Marta's Legacy Boxed Set.